Bentley Designs Atlanta two tone bedside three drawer cabinet. The Atlanta tow tone wooden three drawer bedside cabinet from the Bentley Design range. 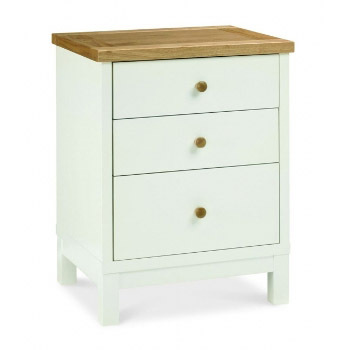 This appealing 3 drawer bedside table in painted white with a oak top is both attractive and practical. The new Atlanta collection takes its styling from the discontinued Atlantis bedroom furniture collections, and we're confident that the latest range will prove to be just as popular.